Compression fittings are designed to keep natural gas where it belongs, inside the pipe. NORMAC's distinctive bead-tipped gasket does its part, working together with other components, to do just that. Our gaskets are custom molded to exacting specifications to provide excellent compatibility to natural and propane gas. Those shiny beads in our gaskets are critical for cathodic corrosion protection of steel pipe. 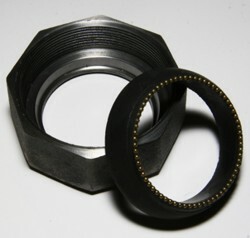 These beads have been precisely engineered to provide an electrical connection between the fitting and the pipe. This is on the atomic level, of course, measurable only with extremely sensitive equipment. By bonding the coupling to the pipe, corrosion engineers are able to prevent the pipe from corroding away, for decades at a time. NORMAC fittings, too, maintain their seal over those many decades. Testing over the years has proven the margin of safety within our design. One example of this testing proved that the NORMAC design is capable of withstanding 1900 psig air pressure without failure. Today, the most severe test of a compression fitting is defined in ASTM F1948. As part of this standard, the assembly is cycled between -20F and +140F for a total of ten times and then pressure tested. No pressure loss is allowed. Not only do NORMAC fittings with bead tipped gaskets pass this test, we led the ASTM team who wrote the standard! These results are made possible by NORMAC's excellence in engineering.